“Yannix Goes to the Kitty Cats” (Give It 2 Get It #14) – Yannix(Thailand)Co.,Ltd. The New Year is upon us, and with the new year, the Give It 2 Get It program (G2G) is back for another season of community oriented and environmentally conscious events. The first event of 2018 (G2G #14) took place on Saturday, January 27 when Yannix went to the kitty cats. 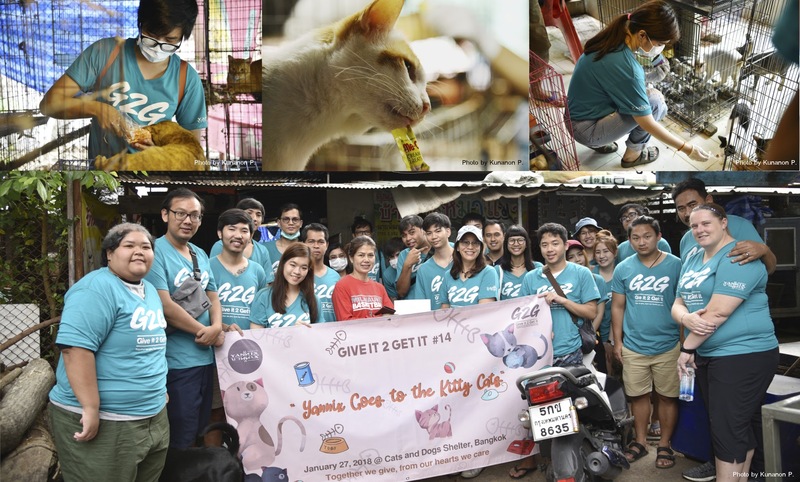 Roughly thirty Yannix volunteers visited Mae Pim’s Cats & Dogs Shelter here in Bangkok. (Mae means mother, and Pim is the name of the owner/proprietor). greeted the Yannix volunteers at 10.00 AM on the day of the event. As volunteers toured the facility, Ms. Kornnara explained that there are approximately 400 cats and dogs currently residing at Mae Pim’s Cats & Dogs Shelter. In advance of the event, Yannix volunteers had raised money to help pay for medicine and other necessities including cleaning supplies such as trash bags, and sterilizing solution. Throughout the day they also treated the cats and dogs medically, as necessary, and cleaned up their surroundings, crates and cages. And, most importantly, Yannix volunteers also brought pet snacks to a very excited audience of felines. As the event closed, Ms. Kornnara told us she was very impressed with the efforts of the Yannix volunteers, and she told us how much she appreciated everything we did to help. Lastly, Ms. Kornnara invited Yannix’ G2G to come back again someday. Thank you to everyone at Yannix and Mae Pim’s Cats & Dogs Shelter who helped to make this wonderful event a success.